So I was sick for over a week. Really sick. Maybe the flu, maybe just a really bad cold, who knows. This gave me a lot of time to think, and peruse Pinterest which, of course, is a very valid use of my sick time. 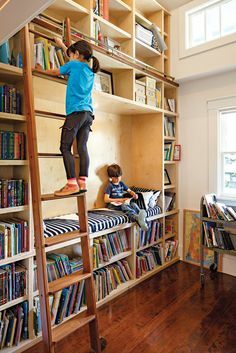 All of the sudden it hit me, we NEED to create a reading nook for the kids! 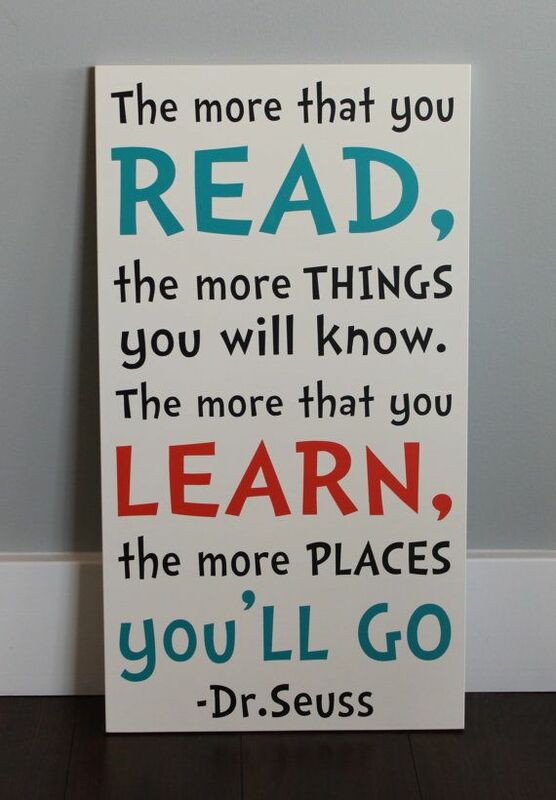 My kids who read love to read and they will read anywhere. But how awesome would it be to have a magical special spot set aside just for reading?! I decided on the spot, our upstairs landing in the hallway near the kids rooms. It’s an unused space that could turn out really cool and if there was a pretty reading nook there it might discourage me from leaving laundry baskets of clean clothes in that spot, you know to remind me to put them away. Hey, I’m a work in progress okay? I have a few stipulations for this project: 1) It must be free or cheap, 2) It must appeal to both the boys and girls, 3) It must be awesome. This is certainly magical and can be created very inexpensively! However, the boys did not approve, they felt it was too girly. 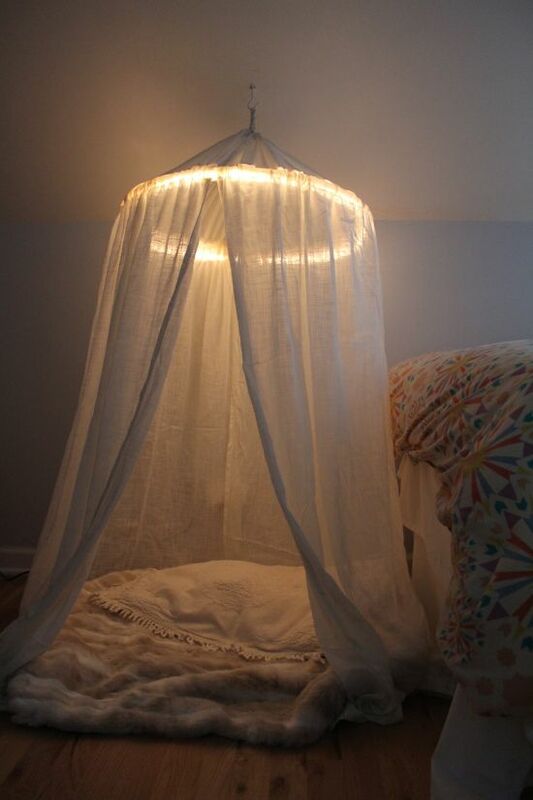 Still it’s a very cool idea using a hula hoop and a simple sheet. To me this is just as magical without being overly feminine. It also seems very easy to put together, at least easy with the help of my husband. 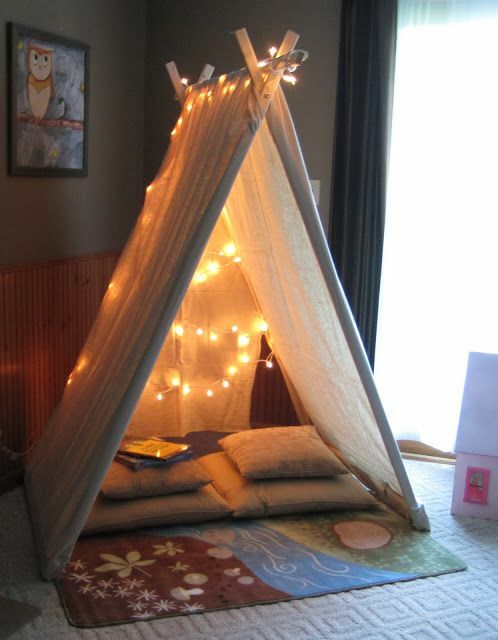 Finally, the reading nook tee-pee! This is so fantastic, probably a little more difficult than the first two but I think it would be worth the work. All the cozy pillows inside just beckon you to come explore worlds away in your favorite books, no? So those are the ideas I have to choose from, now it just comes down to deciding and getting to work. I’d love to hear your ideas on the matter! 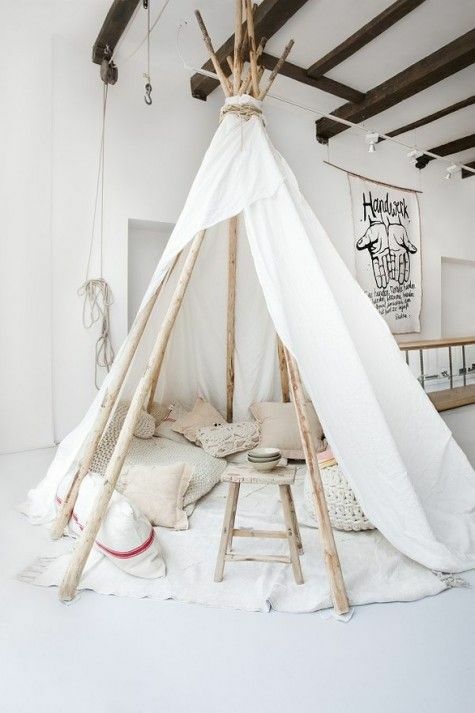 I love the tents! I think it would be great for the whole family… Although maybe not at the same time.